A uniquely inspiring and results-driven fitness experience in a friendly, fun atmosphere can be yours! 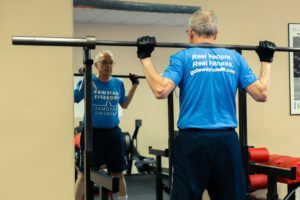 Lose the mundane static cardio and standard weight training routine and get in the best shape of your life (at any age) at Gateway CrossFit Personal Training in Clayton, Missouri. 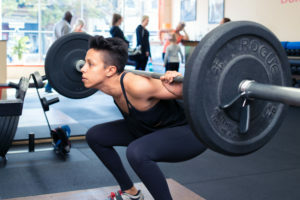 Our commitment to you is to be your personal trainer or “coach for success” providing a safe, effective CrossFit training experience steeped in excellence with obvious and exciting rewards. You will see results far beyond what you have previously experienced in any other fitness regimen. At Gateway CrossFit Personal Training we believe the fastest and safest route to your fitness goals begins with the mastery of movements. Without years of experience, this is best accomplished through personalized coaching. We are a personal-training-only facility that offers fitness coaching individually, in pairs, or in trios. And while we offer 1-on-1 training, we strongly encourage our 2-on-1 and 3-on-1 training. Not only are these sessions more cost effective, training with one or two “workout buddies” fosters an experience that is more fun, more motivating, and leads to better results. Check out the reviews and testimonials from our physically fit, joyful clients that are real folks just like you. Their life-changing stories will inspire you to start on your fitness and wellness journey today! Gateway CrossFit Personal Training operates on a pay-as-you-go basis. There are no membership dues. Session length is approximately 55 minutes. Prices listed are per person. *Save $5 per session when you buy ten sessions at a time! BE SURE TO ASK ABOUT FREE SESSIONS THROUGH OUR REFERRAL BONUS PROGRAM! At Gateway, we firmly believe fitness and nutrition go hand-in-hand for optimal wellness; we can make nutritional recommendations to help you reach your goals faster. We also offer AdvoCare products: innovative nutritional, weight loss and sports performance products that we believe are some of the best on the market. Ask about whether AdvoCare can enhance your goals at your initial appointment! Don’t wait to start looking and feeling your best – contact us for your complimentary first visit and get started on the road to complete wellness today! 314-726-4702.